This card was simple to create and (I think) it carries a sweet message:). 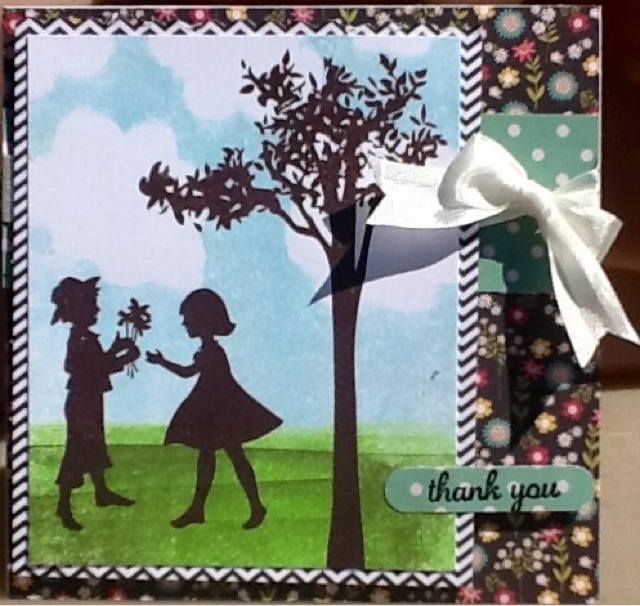 I started with Stampin up while cardstock and cut it larger than needed. I thought when I seen other cards completed in this fashion a Breyer had done the work (plus I couldn't figure out where my giant mess my daubers were). So in the end I inked up my Speedball Brayer with CTMH ink, I started with the blue and worked down to the green grass. On the grass I rolled the Brayer back and forth to get the hilly effect. The clouds were accomplished using inkadinkadoo masking paper. Next I inked up CTMY Childhood Portrait images (tree and children) with black ink and placed on the cardstock. My next adventure was to size the card and trim it down. I used CTMH seam binding ribbon. i MUST say that it is one of the nicest ribbons i have ever used! love it. it is soft and silky and ties in a sweet bow like a dream! it is worth the money and i wish i had more of the stuff.I love the patterned paper in this line. It is from Simple Stories. I always finish the inside of my cards and the inside of this is strips of patterned paper laying helter skelter. I really like how you made this card, it is really lovely. Another great creation. What a fun interpretation of the sketch! Love it!